Some retreats are real, actual, tangible journeys to meditate in a monastery. When that is not feasible, another intangible retreat can be practiced through mindfulness meditation, journeying in our heart mind to re-nourish ourselves at the spring of a retreat we have attended in the past. This month Plum Village Monastery in the south of France, is again hosting a 21 day Retreat with Zen Master Thich Nhat Hanh. While I wish I could be there again, my current vow is loyalty to my book tour–and we have been on the road a lot with Pulling Up Stakes: Stepping Into Freedom. 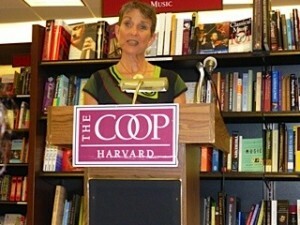 Just this past week, we were at the Harvard Co-Op Bookstore in Cambridge, at the Vassar College Bookstore in Poughkeepsie, and in privately hosted “Meet the Author” events in New York and in Washington DC. More about that later. Now, in my heart’s mind, I am re-envisioning my last retreat with Thay (“teacher” in Vietnamese, for the Venerable Zen Master and poet Thich Nhat Hanh, nominated for the Nobel Peace Prize by Martin Luther King). Being on retreat with him is like a long cool drink of refreshing spring water after a long, long hike. It is so replenishing! So fresh! So deeply healing. 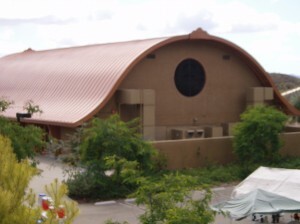 Deer Park Monastery in Escondido, California is my Zen “home” in this Buddhist tradition. I enjoyed coming here monthly to meet with the “Ripening Sangha” from 2001-2006 during the years of my preparation for ordination into the Order of Interbeing. 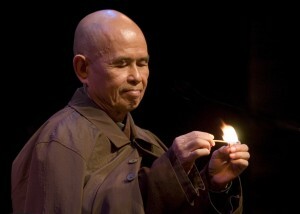 Now, I in my mind I am revisiting my last retreat at my “Dharma home” from my new home in Santa Cruz. What a joy it is! Rosemary, my dharma sister who hosts the Malibu Sangha where I first began to practice regularly (“sangha” is the community who practice together) meets us at the airport. It turns out she has been ferrying arriving retreatants from the airport to the monastery all day. In gratitude I decide to call her the “Roadisatva” as a Bodhisatva is one on the path to enlightenment and who remains dedicated to the well-being of others. We enter the monastery grounds, breathing, smiling and deeply connecting to this special practice center, made more special because our teacher, Thay, now in his 85th year, is in residence and will be offering the Dharma talks through this retreat. All the more poignant because this retreat falls on the tenth anniversary of September 11, 2001. A very good place to be for the mindfulness practice of transformation of suffering. 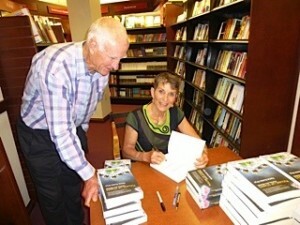 Ten years ago, just after the Twin Towers fell, I was also with Thay in Northern California. 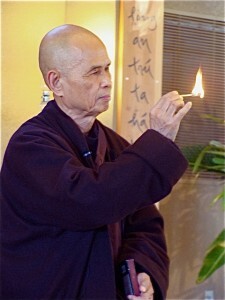 He was leading a September 15′ 2001 retreat for Vietnamese people at Kim Sum Monastery in the Santa Cruz mountains. Everyone there was shell-shocked and grieving about the attack. Our then president from Texas was already talking like a cowboy about revenge and urged Americans to show their pluck by going shopping. Thay was the ONLY public voice I heard calling for restraint rather than revenge, for looking within ourselves to try to understand why others so far away would hate us enough to attack our innocent. As our government set us up for a course of retaliatory war in the Middle East, Thay, himself exiled for nearly forty years from his Vietnamese homeland for refusing to side with either the Communist North or the U.S. backed South, had seen it all before. Speaking outdoors before a giant statue of a contemplative Buddha in the garden of the monastery, with the wisdom of a refugee from a war ravaged country, he knew the dead end alley we were headed for. As he spoke in Vietnamese and I listened through an interpreter, I looked up above me at the canopy spread over the Kim Sum monastery garden. Suddenly, looking at it more closely, I realized it was actually a parachute! These Vietnamese refugees had brought a slightly damaged silk U.S. parachute with them to remind them of the war in Vietnam. Here we were, with these victims of American short sighted engagement in a no-win war in their country, gathering to listen to their pacifist teacher under that relic of a devastating war. It was a kind of “postcard from the edge” foretelling a dark, misguided course for our country seeking revenge and the mythical weapons of mass destruction halfway across the globe from us. Entering the grounds of Deer Park Monastery ten years later brings it all back. Breathe into the sweetness of entering this sanctuary in your mind. In my next post, we will continue. In the meantime, Breathe, Smile, and enjoy your virtual retreat. 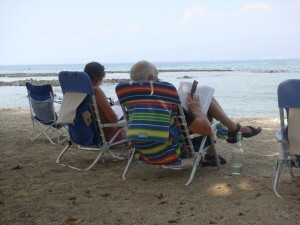 The Zen of Book Marketing: 10 Ways To Succeed Without Losing Your Mind ! Are you like me? You’ve always loved writing. You dove into writing your book with relish, like a kid diving off the dock at summer camp. It’s been a joy, a practice, a discipline and a relatively private exercise. But then, the book is finished, and you’ve entered into a whole different realm. Let’s say you’ve already crossed the publishing Rubicom—whether you are self-published or picked up by a publishing house. You may have a PR firm behind you as well. But we all know that these days, marketing your book, ultimately falls upon your shoulders. Marketing and sales are as far from the reclusive sanctuary of the writer, your head may spin, leaving you feeling flummoxed, conflicted, crazed, and overwhelmed. I have certainly felt that way. But I have both my 35 years of psychoanalytic practice and my Buddhist practice to draw on and share with you. 1) First, reflect deeply on your intention. Did you write this book primarily for your own satisfaction, or did you write it with the intent of seeing it widely read? Unless your answer is the latter, stop worrying about marketing. If you wrote it to be widely read, keep that intention in the forefront of your mind throughout the marketing journey. 2) Second, consider your support system. What resources do you have or can you turn to to help you establish a game plan for marketing your book? Do you have a publisher and or a PR team helping you with your game plan? If you do, make sure the plan makes sense to you and that you are clear about being on board with it. 3) If you do not have a professional support team, what are your own resources? How much time and money are you comfortable with allotting to the project of book promotion? Develop a timeline and a budget that you can live with. 4) Whether you are on your own or have PR support, you will need a good web site; you will also need a strong social media presence. That means in addition to your personal Facebook page, you need a page for your book and you need to attract people to like your page; you need a twitter account to draw more followers. You will also benefit from joining discussions on Linked in groups related to your area of interest, and sharing images and updates on Pinterest. Another great site to create a writer’s presence is Goodreads. And finally, to enhance your web page and your online presence, consider doing what you love best, WRITING—how about writing a blog!? The entry into social media can be very daunting to those writers of us “of a certain age” and may be the most challenging to your equanimity. More support to follow. 5) Consider taking courses to support you in web design, book marketing and social media. I took a very helpful course at my local community college on book marketing and also found a great weekend course on keeping up with social media for marketing, offered by a “social media guru” through my local chamber of commerce. I also met other people in my community to create a mini support group. 6) In addition, look for online courses that can help you with marketing. Informally joining support groups with others who are on the same path in these contexts can help immensely in maintaining your sanity! For example, I have found Beth Hayden (www.bloggingwithbeth) enormously supportive and helpful in creating a successful blog presence. 8) Make sure you frame it for yourself in a way that is fully syntonic with your personal values and ethos. Many people find themselves very conflicted about “selling” as if they felt they were icky snake oil salesmen at a traveling circus. 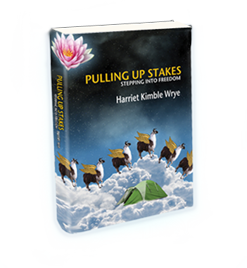 As a Buddhist practitioner devoted to “Right Livlihood” and “Speaking Only Truth” I had my own initial conflicts about selling my book, PULLING UP STAKES; STEPPING INTO FREEDOM (www.pullingupstakesbook.com). But then I realized that the book itself is an act of mindfulness, it traces a journey of gaining wisdom and insight and learning how to “let go” and live more mindfully. So, because it is about surmounting some of life’s greatest challenges with equanimity, it is an inspiring offering. If your book is a genuine offering that you believe will benefit, illuminate, inspire and or entertain readers, and not some kind of snake oil scam, then you need to keep reminding yourself that you are offing merit not compromising your core values or behaving like a sleaze! 10) Engage in your daily routine at your computer doing your due diligence on your social media sites as a mindfulness practice! Rather than seeing it as an odious chore, consider it as an opportunity for practicing mindfulness. Pay attention to your posture, sitting comfortably, breathing consciously, communicating openly with your book’s potential audience as a privilege not a task. Remember you are offering something of value, something from your heart and soul, it is an offering. If you, like me, are a writer, “of a certain age” consider that learning all these new tools is like studying Chinese—it keeps the old brain active and engaged! Ponce de Leon, Here We Come! Practice smiling meditation sitting there at your desk. I do. We Need All the Help We Can Get Packing for Our Trip! OK, so how about approaching this task of packing from a different energy bank? In our three year sabbatical of traveling around the world, my husband Jim and I have packed and unpacked so many duffels I couldn’t begin to count them. And, I am happy to say, I have learned a LOT about how NOT to do it, and how to do it so it doesn’t make you crazy. I’m happy to share some tips with you. First, don’t leave your packing to the last minute. Last minute packing is inevitably harried and fraught with anxiety. Consider that packing can actually be an enjoyable entre into your vacation. 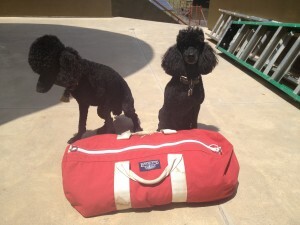 If you are going on an organized adventure travel trip, you will probably be given some packing tips. Pay attention to them. They know what they’re doing. Weed out everything non-essential. Whenever possible, take the lightest most easily packable and washable version of what you need. Remember, you’ll be travelling, keep it simple. When you are schlepping your bag in and out of airports, buses, trains, etc. you will be so grateful that you didn’t bring that bulky coat, or those heavy shoes or that extra outfit. Take an extra, empty, folded up lightweight carrying bag if you think you might be “collecting” treasures to bring home. Also, consider, if you are going to a third world country where people may need things you could donate, that you might even lighten up as you go along. Finally, allow time AFTER your bag is packed and before you get into the car, or the cab or whatever conveyance will take you on your dream vacation. SIT DOWN and BREATHE. If you do, your departure will be infinitely calmer and more enjoyable, and if indeed there IS something you forgot (say, the airline tickets) you have time to calmly retrieve them and still keep your smile and your equanimity. And on the subject of leaving plenty of time, DO leave plenty of time with that mindfully packed duffel if you are taking public transport, to get to the airport, deal with traffic delays, go through security, etc. Breathe…….Smile…….Enjoy…..
Have you ever been in a House of Land Sharks? No? Well, Full of tooth and ire, they may come upon you in stealth, rip your flesh from stem to stern, and proceed gaily off to chase another prey, just for the sport of it. You’d best be, in the noble scouts’ term, Prepared! To prepare for entry, be sure you have a few tricks and treats aboard, an amiable disposition and a willingness to get down and scratch behind some ears (gills) if need be. A couple of tennis balls may come in handy as strategic distractions–fearing an impending shark attack, toss the balls and pray that their retriever instinct will derail the attack. Better yet, they may return to you, their teeth fully engaged with the tennis ball, not you, and panting, dropping the ball, tails swishing, entreat you to toss again….and again….ad again. In which case you have fully successfully fended off a dreaded shark attack. 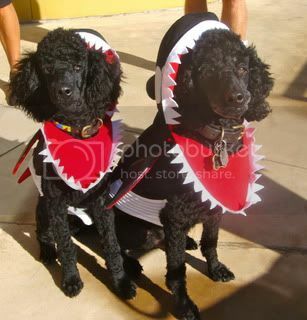 On closer examination of your new fan club, you will discover they are not land sharks at all, but a pair of poodles dressed up in the silliest of costumes. Here you have it: Beau and Tashi, dress up to greet guests from the Santa Cruz County Cycling Club for our Annual Not So Progressive Ride. And, what else? These timely costumes, (gleaned from The Bark Place’s Going Out of Business Final Sale) also celebrate this year’s auspicious passage of a smart new California law banning the sale of Shark Fins for Shark Fin Soup. 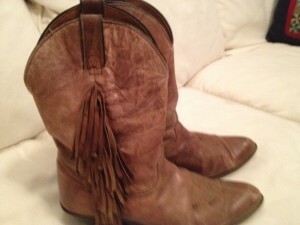 How to Score A Real Paniolo’s Boots—What a Score! 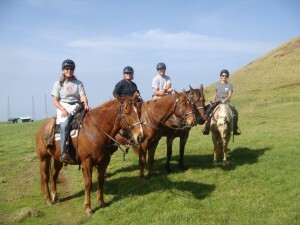 This part of the island is a cowgirl’s paradise, vast expanses of grassy ranch land, rolling hills, rows of trees for windbreaks, valleys, cattle and beautiful horses, in the shadow of Mauna Kea crater and overlooking the Kohalo coast. 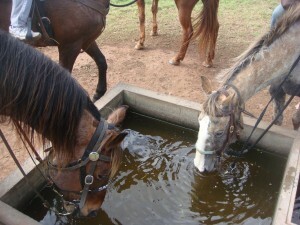 And two of my best Santa Cruz cowgirl riding buddies Berta and Elise, are here this week, so we’re gonna ride!! Jim is disappointed that Brian, Berta’s husband has been unable to join us due to pressures from…..what is that distant memory? Work? 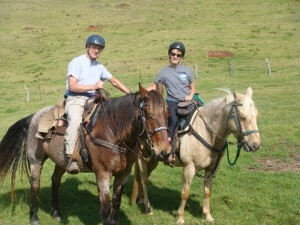 So Jim’s gamely joining the cowgirls for a day on Kahalo Ranch riding Na’alapa horses. Nope, no stilettos here. But not my usual riding garb, either. With the weight and girth of our tandem bike box, we had to pack minimally—so I’ve got on bike tights and bike shorts (not bad, actually, ‘cause they have a padded seat and no wrinkles to rub against the saddle) and the sneakers I planned to leave on the island. But Liz actually has a whole closet full of cowboy boots, heavy duty wind and rain gear and helmets, so we pick our sizes and suit up. She carefully chooses a mount just right for each of us and I end up with Max, who is the personal horse of Kohalo Ranch owner’s granddaughter. Right away, I realize I am quadruple lucky: the weather is perfect, balmy, sunny and calm; Jim is riding today(!) with my cowgirl buddie; great horse and guide; and these well worn boots I’ve got on fit like a glove, way more comfortable even than my cowboy boots at home.The ride is a joy—the weather is clearly totally perfect and totally unusual, judging from the abundance of foul weather gear in Liz’s tack closet. We trot, we walk, we lope and we stop to gaze at the incredible views and take pictures. And the surprise at the end, when I tell Liz I’m bonding with these old paniolo boots and so sad to take them off, she says, “Walk right on out, sister—I never saw it happen. They’ve got your name on them—and there’s plenty more at the thrift store in Waimea.” So, sad as we are for this trip to end, I’ll be walking and riding in these comfy old paniolo boots back at home before the week is out. Lulled by our extraordinary night of solitude at Laupahoehoe into every traveler’s dream of being the ONLY ones going wherever, it didn’t even cross my tropical brain to make advance reservations for a shuttle or mule driven wagon ride down into Waipi’o Valley. Dream on. All reservations, I discover are already fully booked—but we soldier on to the small country store past Honokaa to find luck is with us again. Because we do not weigh what average Hawaiian natives weigh (maybe averaging 500 pounds per couple) but only total out at 280 for the both of us, the mule wagon can handle us after all! A 4WD Shuttle carries us down another phenomenally steep (27%) grade of switchbacks to the valley floor (Oh, well, on a bet Lance Armstrong was able to cycle straight up it in 47 minutes) where we meet our stalwart mules, Maui and his ornery brother Ma’iha, hitched and ready to take us around the isolated Eden of Waipi’o Valley, the sacred hiding place of King Kamehameha I during his infancy, and once home to thousands of reclusive Hawaiians cultivating taro, coconuts and bananas. However in 1946 a great tsunami devastated the valley and now only 50 or so intrepid counter-culture types live here in huts mostly without amenities, but with more than enough solitude and beauty. 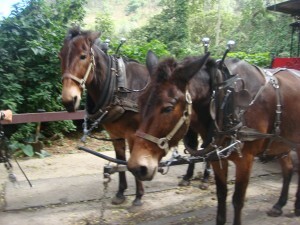 The mules gamely pull the lurching wagon through rocky riverbeds and up muddy embankments while we pray it won’t flip over—or a camera won’t fly off into the drink. After that fortuitous adventure, we carry on up through the vast ranch holdings of the Parker Ranch, across the saddle between Mauna Kea and Mauna Loa and down to the Kawaihae Coast on the dry, leeward side of the island. We aim south, pointing Winnie toward Puako Beach and the land owned by our Aptos neighbors, and my horseriding buddy, Berta. We shimmy Winnie back into their Kiawe lined driveway to park and “camp” for the next four days, while Berta shouts warnings to us about the incredible damage Kiawe thorns (up to 2 ½ inch long and tough as nails) can do to tires and the soles of shoes. 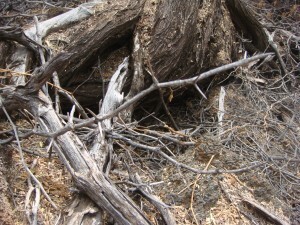 Don’t even THINK of walking barefoot! 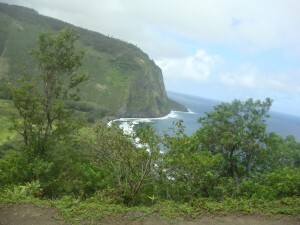 But once we disembark, we are enchanted by the gorgeous cove that will be our last respite on this Pacific odyssey.